The whole concept of starting off a supporter Foodbank at Newcastle United came from the fact that fellow FSF members from Everton and Liverpool had started something similar on Merseyside which was proving to be successful, namely Fans Supporting Foodbanks. Aware that the problems being faced in the North West would be no different to those faced in the North East, the fact that our own West End Foodbank was the biggest in the country, and on the back of the exposure nationally from the film “I Daniel Blake” we decided to do something about it. In today’s society it’s a disgrace that foodbanks are needed but while they are, we were confident the football fans family would do what they could to help. Soon, NUST Board member Colin Whittle was meeting fellow fans Bill Corcoran and Steve Hastie from Fans United and the whole NUFC Fans Foodbank grew from there. 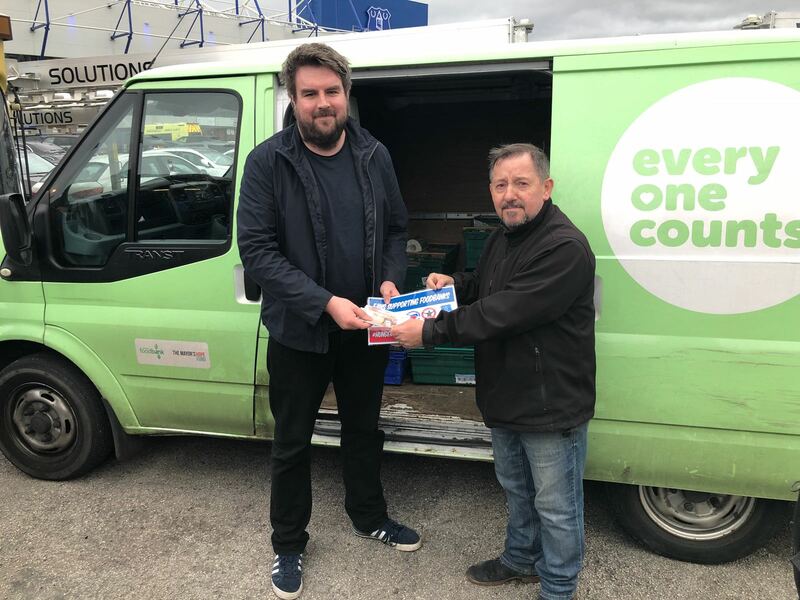 We have kept in contact with our fellow fans from Merseyside to learn from their experiences and both our home games against them resulted in donations being received from Everton and Liverpool fans groups under the banner of Fans Supporting Foodbanks. Furthermore, when the FSF organised a national Fans Foodbank conference in October hosted by NUFC once more our Scouse friends attended en- masse with a donation for NUFC Fans Foodbank. We remain grateful that they contributed to our own worthy cause. their collection point prior to the Everton match and was able to exchange stories of the work being undertaken and the support provide by NUFC fans in our own great City. 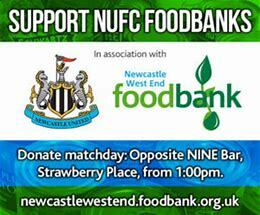 NUFC Fans Foodbank will be back for Saturday’s game. We are proud to be involved in this initiative and grateful to all those who have contributed or been involved in any way. Our thanks go out to our fellow supporters who have made the NUFC Fans Foodbank such a success and to fellow fans on Merseyside for providing guidance and advice. Football fans working together for a common cause! Hunger doesn’t wear club colours.